Everything you need for a successful hatch, incubator has a see-through dome for easy egg observation during hatching. 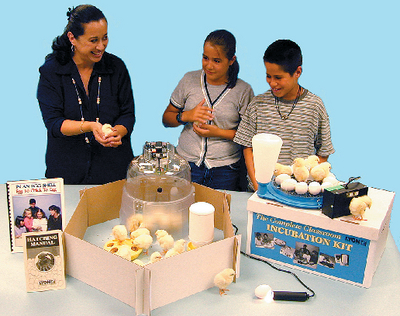 Kit includes solid state temperature controls, wet and dry bulb thermometers, 18 egg turning rings for chicken eggs and an automatic egg turner. Also includes six extra humidity wicks which allow for six incubations, a mini brooder ring with legs, a drown-proof waterer, an electric egg handler, a 6' cardboard chick containment ring that fits around the brooder and feeder after the hatch. Illustrated manual provides a hands-on teaching guide/lesson plan to help enhance your students’ experiences.